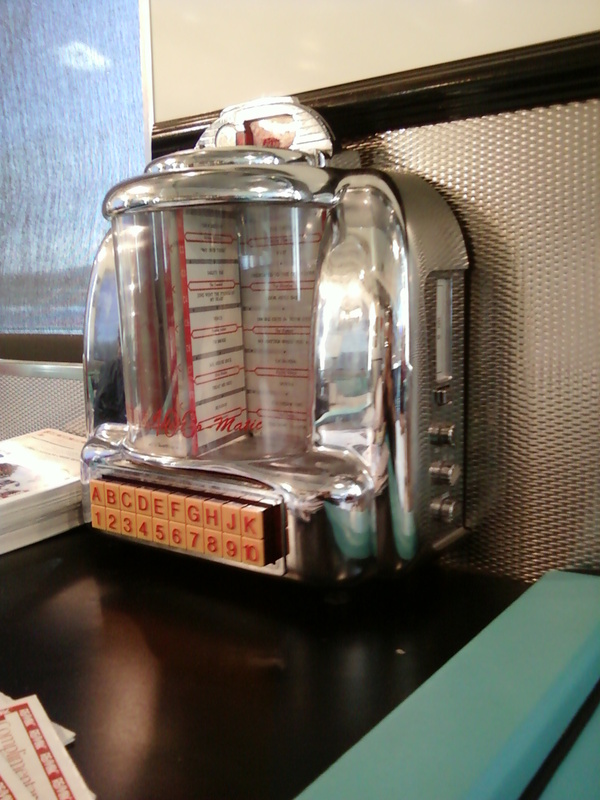 Experience the 50’s in a Classic Diner.. Being on the farm, travelling to our surrounding towns usually only happens when we have a destination planned. There is not allot of random cruising as our time and energy is put into the care of the animals, so to get off the farm is considered a treat. 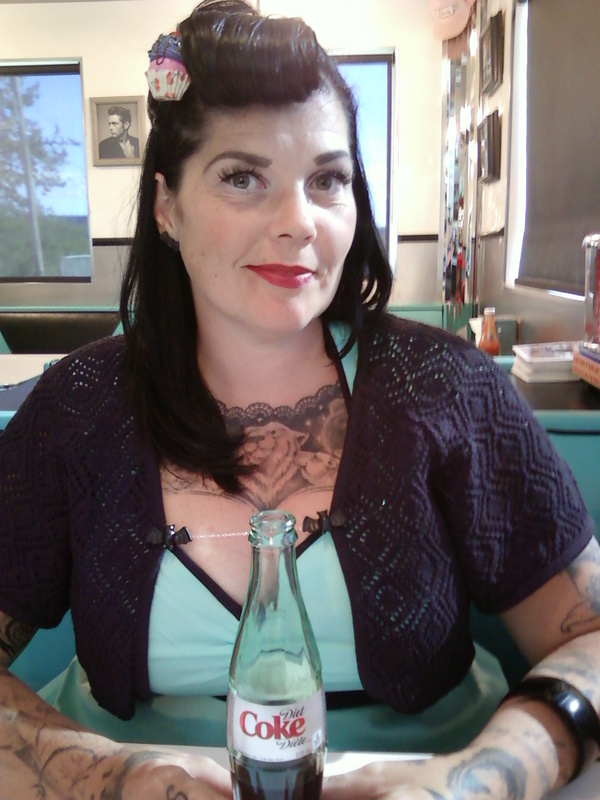 We were heading to a Rockabilly Rumble in Hythe AB, which has us drive through Dawson Creek that sparked a reminder of sorts to “Check out the Diner” one day. We do not get to Dawson Creek often yet drive through it a fair amount when heading to Edmonton. The chrome of Stuie’s is like a beacon to my heart and the glimmer in my eye to track it as we drive along 8th Street as we pass through. I have always said, “We should stop there..!” Who knew today would end up being that day for me. After leaving the Rumble sooner than expected I wanted to make a mark on this day. My hubby and I were out on a Date Day in celebration of our 9 year wedding anniversary and with his work we don’t always get the time alone we want. As we were heading home it came to me that we should finally stop at the Diner, we were both dressed in our finest 50’s wear and what a great chance to turn this day around..! As we pulled into the parking lot that has ample space the shine on the Diner was incredible, as I went up the front steps my sight was momentarily taken from me as I entered the Diner and it was almost dream like when my sight came back to me. 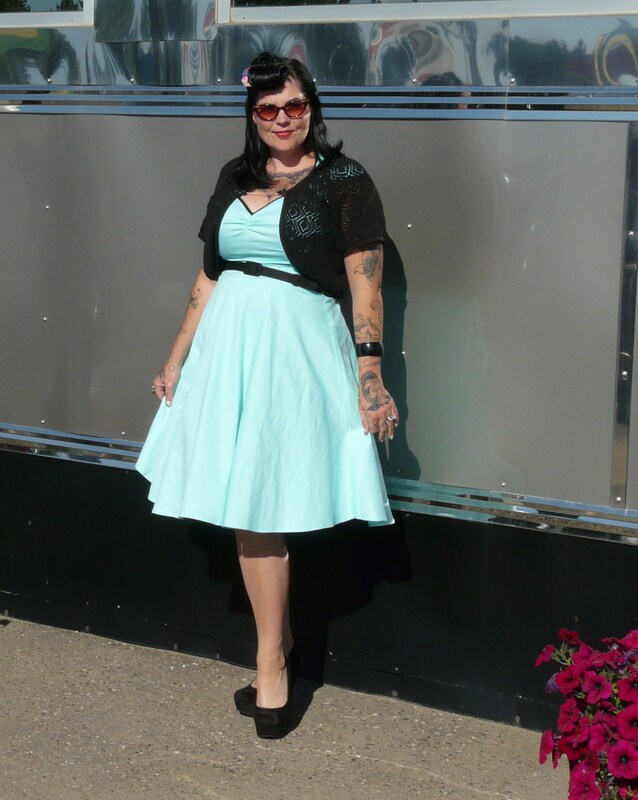 Almost as if it were planned my dress of Mint green and black matched the interior of the Diner’s colour palate. My breath was taken and I wanted to squeal in delight out loud which I actually probably did as I could not contain my excitement that I finally had the chance to be in this little gem. Once sitting down in our booth I took to really appreciating the details of the diner, the art and sign-age was appropriate and tastefully done. 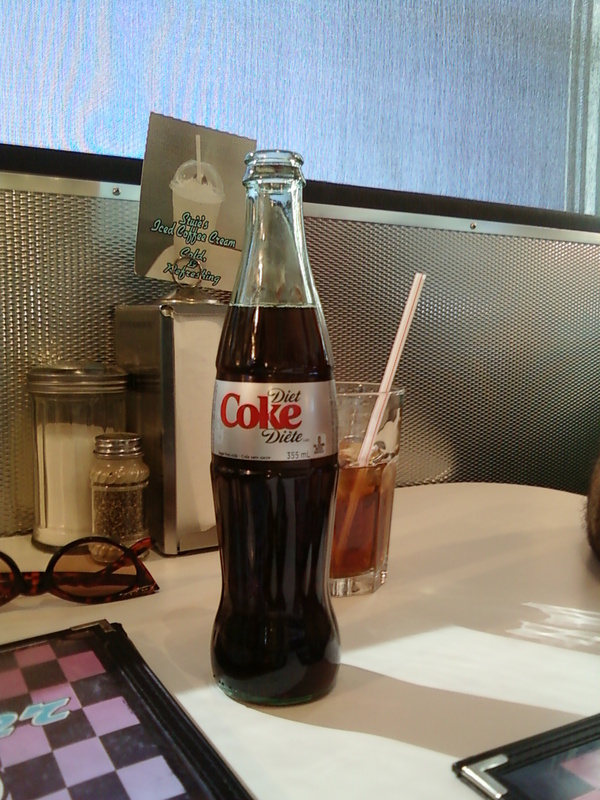 Everything looked from the times and I was even offered a glass bottle of pop which thrilled me too. 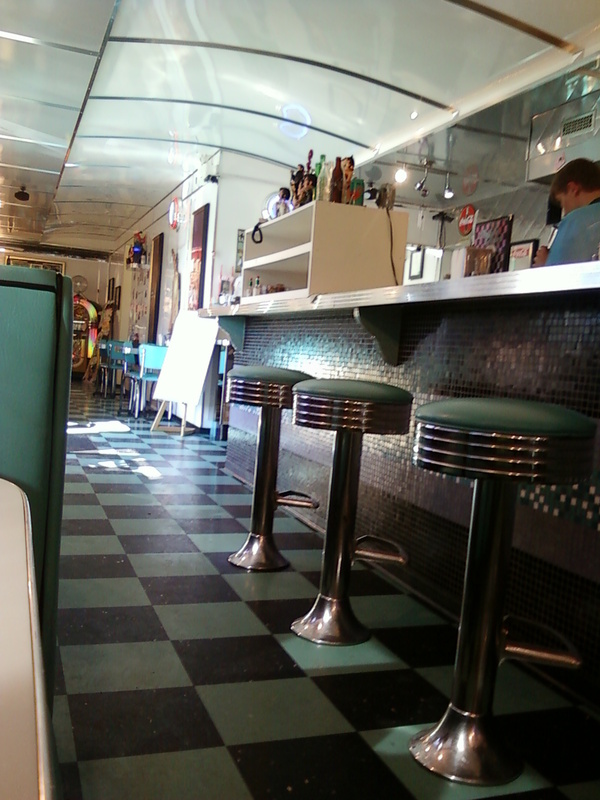 The diner was very clean which was very impressive to me and you could really feel the attention to detail. There was a Juke Box in the back corner and behind the booth we sat in was the table top mechanism you could order your tunes through. Ordering our food was quick and as we sat close to the kitchen area we were able to follow the production of our food being made, served up and then brought to us. 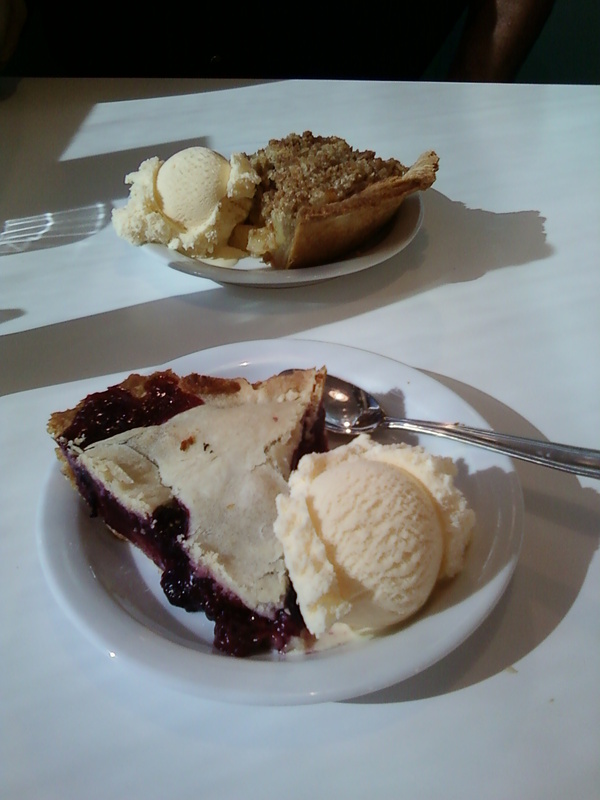 After our lunch we ordered dessert and there were a fair amount of pies to choose from. Louis picked the Apple a’la mode and myself the Bumble Berry. Oh this was truly the highlight of the day..! I am not a huge pie person yet I ate this dessert in record time. Even Louis noted the speed in which I devoured the sweet and tart berry pie that took me back to my Grandmother’s kitchen. I am not even sure what a bumble berry is, I do know Stuie’s did it justice.